The prevailing notion that sports cars are just a pleasure for two was now contradicted by Kicherer. The renowned Mercedes embellishing specialists from Stockach have enriched the CLK 63 AMG, which is actually a two-seater, with a sporty back seat. When you take the north loop in less than 8 minutes with this bolide, all those seats will definitely provide more fun – and adrenaline – than any rollercoaster. And what is more, those additional seats guarantee a Black Edition with a significantly improved road capability. But, Kicherer will even delight design and sports enthusiasts. The radiator grill, already quite impressive on the standard version, is replaced by an even sportier variant made of carbon and featuring carbon fibre struts. The beautiful forged three-part wheel, Kicherer RS-1, also fulfils a double function as it is a visual and – thanks to weight reduction – also a sportive gain. The chassis – specially developed for Kicherer by DTM specialist H&R – also improves the racer’s cornering dynamics by several degrees. Since the Kicherer engineers have taken care of the engine, too, they have further underlined their reinterpretation by carbon mirror shells. 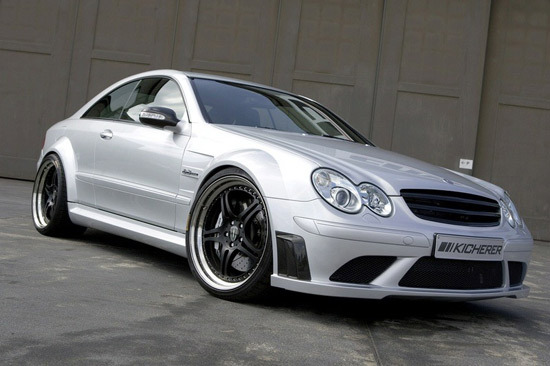 With its 540 hp, the Kicherer CLK racer gained about 33 hp. Even the torque has been improved by another 20 Nm. Thus equipped, the Kicherer CLK only needs 4.1 seconds from 0 to 100 km/h and runs fasterthan 300 km/h – thanks to a derestricted V/max. In order to delight any fellow passenger’s vision, Kicherer has equipped the car with additional carbon intarsia. These do not only include – as is usually the case – parts of the centre console and of the door linings, but also ultra-light front seat buckets made of genuine carbon. Therefore, even at a red light, the “normal” Black Edition becomes a Kicherer Racer.